Date nights are the best aren’t they? On Friday night, Ian and I went out for dinner in Skipton and I wore coated skinnies and a recent impulse purchase, this constellation print top (£29.50, M&S). The silver and teal metallic detail on gauzy navy mesh proved to be irresistible. At the same time I bought a midi dress in the same print. (There’s a photo along with a link at the end of the post). 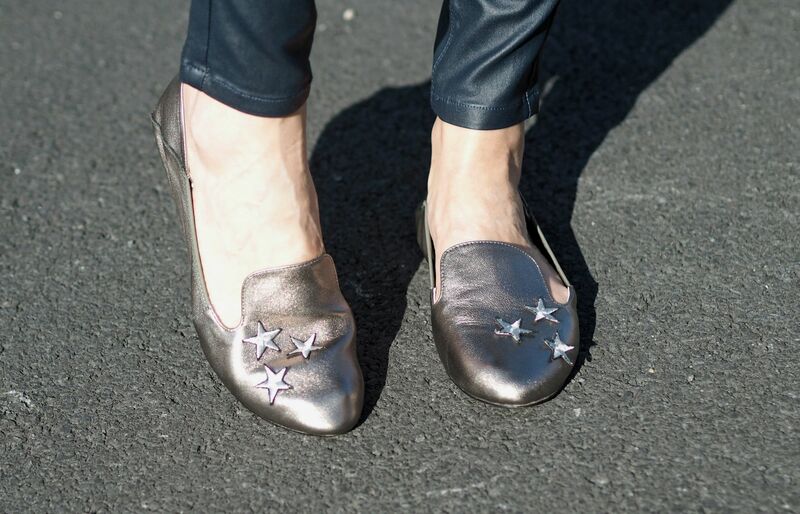 Teaming a pair of coated skinnies with a sparkly top and heels is an easy way of putting an evening look together. I love autumn winter dressing. The dark blue coated leggings are from Next and I bought them in berry too. I had a berry pair last year actually, which I wore over and over, but managed to get a hole in. Each time I wore them, my fourteen year old boy accused me of having a midlife crisis by virtue of wearing leather jeans. He has a point. Not about the midlife crisis, (I hope), but about the fact that from a distance, they could be mistaken for leather. Either way, I think they’re brilliant and I know they’ll be an autumn winter wardrobe staple once again. I love all things celestial and this double stars ring is one of my favourites. It’s by Danon and is from my own jewellery website, (£25). It comes in gold too. The moon and star necklace is from an excellent range at Marks and Spencer. My grey high-heeled ankle boots are by Lotus, one of my go-to footwear brands. They grey microfibre upper contrasts beautifully with the black heel and sole and with the gold detail. Not only are they comfortable, they are versatile too. They look fabulous with dresses, tunics and midi skirts as well as with jeans and coated skinnies. Instead of a coat or jacket, I wore a mohair serape. 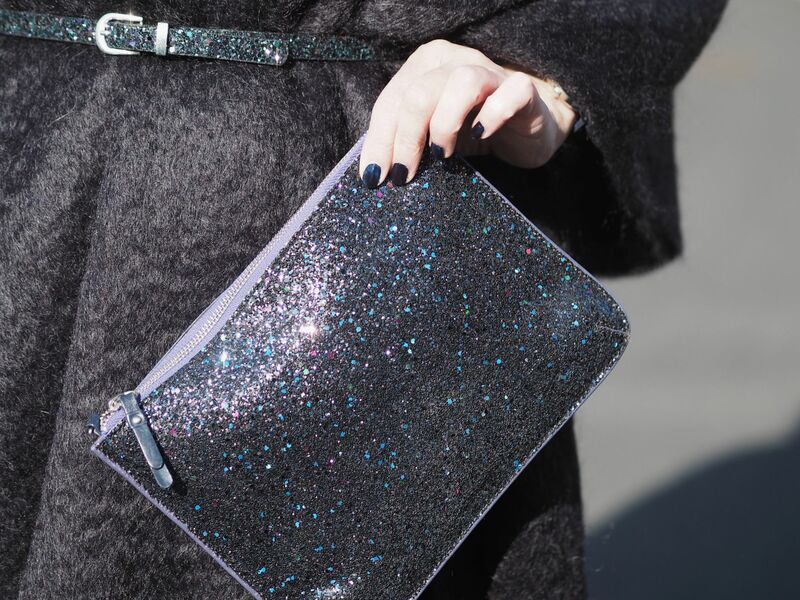 I added a multi-coloured glittery belt which matches my clutch, both of which were from Boden several years ago. I recently wore an ecru serape with jeans and wellies for a casual look and a navy serape with a desk to dinner dress for a more formal look. It’s surprising how many outfits a serape works with. I live within walking distance of central Skipton so we travelled to and from dinner on foot. 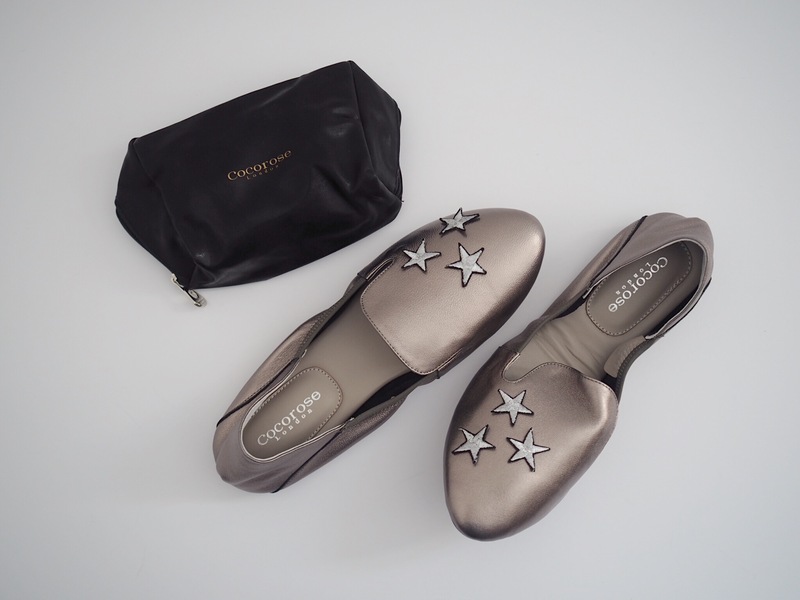 Although the ankle boots are very comfortable, there are a lot of cobbles to traverse so I wore these *foldable leather shoes from Cocorose London. (Did I mention I like stars?) They have a stellar range of other designs and they come beautifully boxed and with their own pouch. This is the printed mesh star print dress, (£49.50) I mentioned earlier. I’m going to wear it for my birthday meal next month with these grey ankle boots. 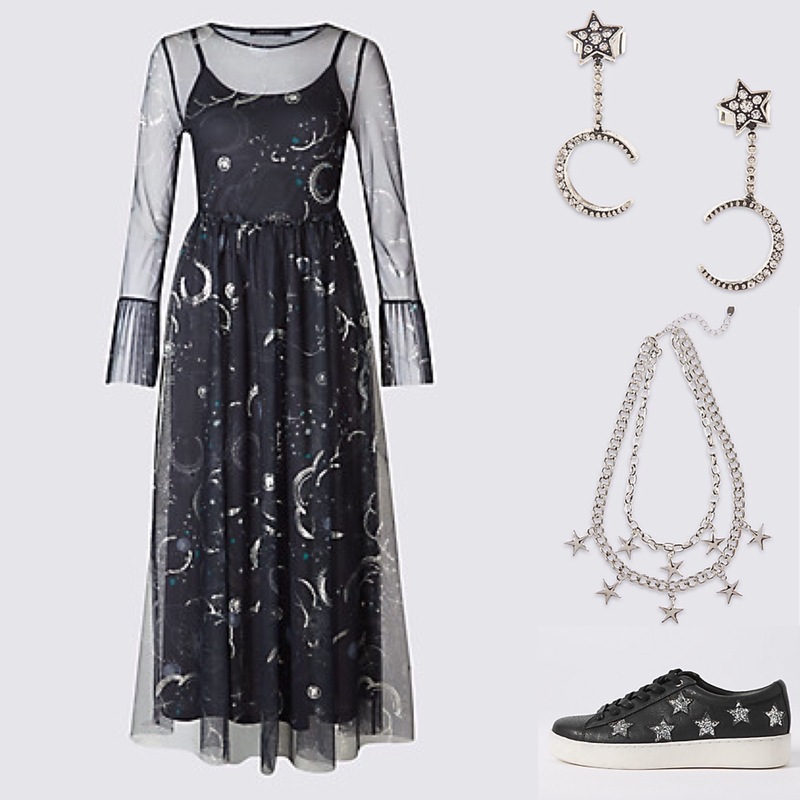 (I really like the star trainers too as well as the star and moon drop earrings and the chunky star necklace). This is the rest of the Danon star jewellery available at LizzyO. This post was sponsored by Lotus. As always, my opinions are 100% honest and the content is my own. Thank you too to Cocorose London for the fold-up shoes and to Samuel Tweed for the loan of the serape. (The serapes will be available soon in the Samuel Tweed webshop, so do keep an eye). Thank you for supporting the brands that support What Lizzy Loves and in particular for supporting LizzyO, my own small business. I’ll link this post to I Will Wear What I Like, Brilliant Blog Posts and The Saturday Share. Later today I’ll be en-route to River Cottage via an overnight stay in London. Hopefully I’ll have the opportunity to do some Instagram Stories, so stay tuned. It should be a fabulous few days! Funny how different things appeal to different people – you look at that dress and think “Dior”; I think “Kids Halloween fancy dress”…..Sorry!